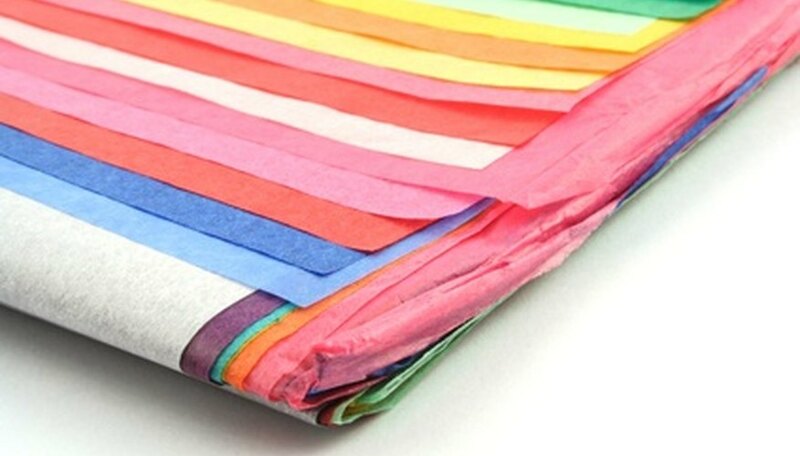 Tissue paper can solve a variety of sewing problems, such as attempting to work with difficult fabrics. A major advantage to this paper over others is that it can easily be torn away from the fabric when the sewing is completed. It can be used as a seam stabilizer, a way to keep slippery fabrics from sliding around under the presser foot, to keep velvets from napping incorrectly while sewing and to let your machine slide more easily over sticky fabrics, such as oilcloth. In addition, tissue paper can help keep knits from running and picking during the sewing process. Sew a test swatch of fabric. Cut a small piece of fabric and tissue paper and test it out on your machine. You need to check the capability of your machine to feed the fabric, as well as the stitch tension. Some fabrics, such as oilcloth, need tissue paper between the presser foot and the material to keep the machine running smoothly. Other fabrics may need three layers of tissue paper, one on top, one between each piece of fabric and one below, to keep the fabric running through the machine without snags, pulls or skipped stitches. Cut out your pattern pieces from the fabric. Cut either narrow strips or full pattern pieces from spare tissue paper, not the pattern tissue paper. Thin strips can be used for garments that simply need guidance along the hems. Full pattern pieces are needed if you are using the tissue paper to stabilize the fabric. Pin the tissue paper to the fabric. Using straight pins, attach the tissue paper to the fabric along the edges, within the seam allowance of your fabric. This way, pin holes will not show on the completed garment. This is especially important if you are working with silks, chiffons and other delicate materials. Place the fabric under the presser foot of your sewing machine. Generally, the tissue paper needs to be on top, directly underneath the presser foot, to ensure a smooth stitching process. Gently lower the presser foot and begin sewing. Tear away the tissue. When you have completed the sewing on your garment, carefully tear away the tissue paper from the seams. Make sure you do this prior to pressing the seams, as the paper is flammable.